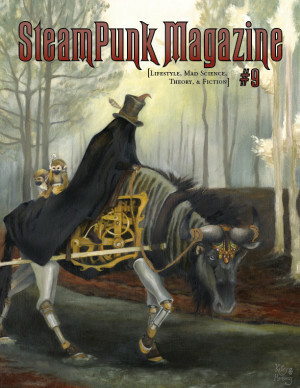 Steampunk Magazine » Bryan Talbot on Bastable, Brass Goggles and badgers. Bryan Talbot on Bastable, Brass Goggles and badgers. Bryan Talbot is a man of many talents; renowned in the field of comics for his outstanding abilities as an artist, Bryan has collaborated with the likes of Neil Gaiman, Pat Mills, Alan Moore and Bill Willingham during his illustrious career. Never a man to be pigeonholed however, 2007 saw the publication of The Naked Artist: Comic Book Legends – a book of humorous anecdotes collected by Talbot during his many evenings spent chatting to other comic creators in convention bars. More recently Bryan penned the graphic novel Cherubs – a supernatural comedy with British indie artist Mark Stafford handling the visuals. Yet, it is arguably in the role of writer/artist that Talbot has achieved his greatest successes; 1995’s The Tale of One Bad Rat earned Bryan much well deserved praise for its beautiful artwork, masterful story telling and sensitive portrayal of a teenager escaping an abusive home life. Alice in Sunderland: An Entertainment is another fantastically well respected work of Talbot’s. The book was several years in the making and is an extraordinarily dense and visually luxurious blend of history, psychogeography and the life and works of Lewis Carroll, amongst other things. However, as wonderful as all Bryan’s above mentioned works are, there is little doubt that by far his most attention-grabbing stories, so far as this publication’s particular field of interest is concerned, feature a certain Mr. Arkwright. Talbot’s The Adventures of Luther Arkwright and its 1999 sequel Heart of Empire (AKA The Legacy of Luther Arkwright) span multiple parallel worlds within a Moorcock-ian multiverse, which logically have more than a whiff of steampunkery about them. Now in 2008, Bryan is midway through working on a brand new steampunk graphic novel entitled Grandville which stars Detective Inspector LeBrock – a “large working class badger” in Talbot’s own words. Grandville is set in a retro sci-fi world populated by anthropomorphic animals and looks likely to become yet another Bryan Talbot masterpiece. Bryan was kind enough to take time out from his busy schedule to answer a few questions about the upcoming graphic novel, his work in general and what steampunk means to him. John Reppion: Bryan, first of all thanks for your time, I know you’re really busy at the moment. When do you think you first became aware of the concept of steampunk? Bryan Talbot: I’m certain that the Oswald Bastable stories of Michael Moorcock that I read as they were originally published must count as the first time I was aware of steampunk as a genre, though the term hadn’t been coined then. I don’t have a rigid definition of it and, more often than not, think of it as “retro-SF”, though I do think that there should be some sort of a gothic or Victorian element. Some use it to describe any sort of SF set in a historical period, e.g. ancient Rome. I wouldn’t go that far. JR: Where you consciously influenced by Moorcock’s ideas when you began including those elements in your work – specifically with the Luther Arkwright stories? BT: Yes, Moorcock was a big influence. As well as Bastable, some sequences in some of the Jerry Cornelius books can also be described as steampunk. There weren’t many more steampunk books around in 1978 when I plotted Arkwright. The Illuminatus Trilogy was another influence, also the films of Sergio Leone, Sam Peckinpah and Nic Roeg, and the works of William Hogarth and William Blake. I’d read Keith Robert’s Pavane so that was probably influential. Queen Victoria’s Bomb was, I think, written in the 60s but I only read it about ten years ago. JR: What do you think about modern steampunk culture? Do you see the emergence of all these new websites, comics and novels as being evidence of the genre coming of age? BT: I’m aware of the phenomenon and have looked at some of the steampunk sites. I even read a New York Times article claiming that it’ll be mainstream fashion by this time next year. I don’t know whether it’s come of age yet, though The Diamond Age by Neal Stephenson is such a damn well written book that I think you can say that it’s come of age as a literary genre. JR: Do you see your own influence in much of the newer stuff that is out there? BT: No idea. I do know that the Italian edition of Arkwright influenced a whole generation of Italian SF writers and even turned them on to Michael Moorcock, who was generally unknown in the early 90s there. In one Italian SF book, I’m even referred to (as a character from history) as “The Divine Talbot”! JR: How and when did the idea of Grandville come about? I think you said you were still working on Alice at the time weren’t you? BT: Yes, just at the tail end. That’s when I usually start to get new ideas for graphic novels – just as I’m finishing the previous one. I was looking through a book I have on the work of 19th century French illustrator Jean Ignace Isidore Gérard who worked under the nom-de-plume of Grandville. He was a big influence on the original Alice in Wonderland illustrator John Tenniel. He frequently drew anthropomorphic animal characters, dressed in contemporary French fashions and his pictures were often politically satirical. It suddenly occurred to me that it could be the basis of a graphic novel – Grandville could be the name of Paris in the centre of a French Empire in a steampunk setting. The 19th century proto-SF French illustrator Albert Robida is another influence. JR: You’re well known for being someone with a gift for adapting and altering their artistic style to suit different projects. Did you have any difficulty coming up with the look of this book and to what extent have you taken on Jean Ignace Isidore Gérard’s influence? BT: I’ve not tried to emulate his drawing style. His work was the inspiration but I’m drawing it in a contemporary European style – almost clear line but with some contour shading – and the style is consistent throughout the book. There are humans in the story too but they’re second-class citizens, menial workers, and they resemble French clear line characters like Tintin. The French call them “dough faces”. Another part of the style is the computer colouring, with which I’ve tried to add a Victorian complexity by papering the walls with art noveau wallpaper and carpeting many of the floors. JR: Can you tell us a little bit about the story of Grandville and its lead character Detective Inspector LeBrock? BT: LeBrock’s a large working class badger. He has the deductive abilities of Sherlock Holmes but, being a badger, he’s also a bruiser and is quite happy to beat the crap out of a suspect to get information. His adjunct and close confidant is the diminutive and elegant Roderick Ratzi, who talks like Bertie Wooster and Lord Peter Wimsey. I wanted to do one of those sorts of adventure stories that starts very small and parochial but gets bigger and more exciting as it goes along until it finishes in an epic climax. The story begins with LeBrock investigating a murder in a small English village (in actuality Rupert Bear’s Nutwood). The trail leads him to Grandville, where he discovers a shocking and far-reaching conspiracy. It’s basically fin-de-siecle Paris, populated by animals and furnished with speaking tubes, automatons and steam-driven hansom cabs. JR: Are you working completely alone on the project or is there anyone else involved? BT: The time I was taking to colour the pages was dismaying me. I was spending longer over the colours for each page than on the pencils and inks. Each page is fully rendered – like a fully painted comic. I now have my friend Jordan Smith, the designer who created the Alice cover, helping me out by placing the flat colours for each page. This is saving me a lot of time. JR: I have to say that I was truly blown away when you showed [my wife] Leah and I the first few coloured pages and pin-ups in Dublin last year. Are you happy with the way the book’s coming out so far? BT: Yes, but it’s just the first draft. I’ll be going all through it again when I’ve done, adjusting the colours and correcting mistakes. I’ve now completed just over half the book, which is all scripted. JR: Is there any possibility of follow up stories set in the same universe? BT: Absolutely. If it does phenomenally well, I’m happy to do a series. JR: In that case, I’ll buy two! Thanks again for your time Bryan. BT: Cheers, John. My pleasure. Grandville is set for release in October 2009 and will be published by Dark Horse in the USA and Jonathan Cape worldwide. For more information about the book visit www.bryan-talbot.com/grandville.